Today turned out to be a slow day as we decided to stay in Pokhara for another day to sort our washing as everything was wet and dirty after the previous day’s being up in the Annapurna Ranges, oh and we I was also suffering from a bit of a hangover from celebrating with the Hearts & Tears Royal Enfield Rental crew which went on very late. 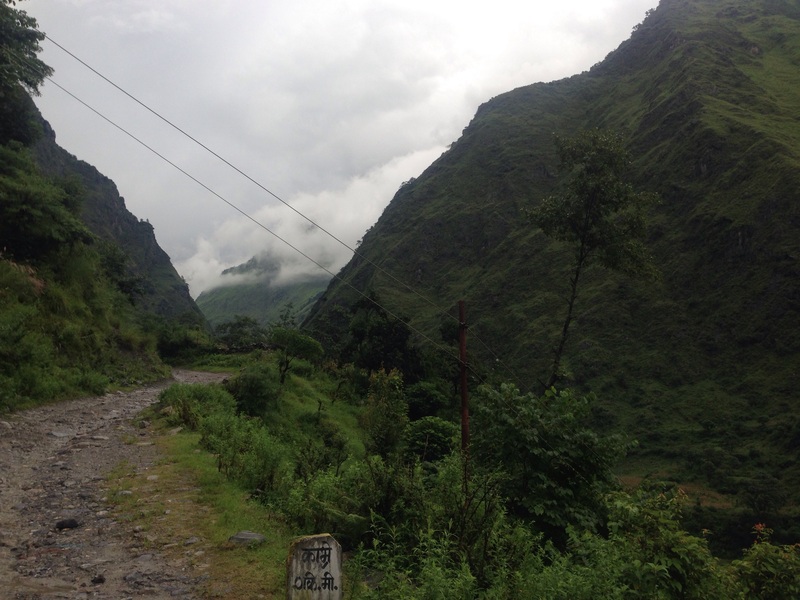 Day 2 Enfield Ride was certainly proving to be a great adventure, both in terms of bike riding and the experience of being in these amazing Annapurna Ranges. We headed further north and shortly found our selves at a large waterfall that was blocking the road for anything but large trucks. Our guide enlisted the help of several local lads who carried the bikes down the hillside across a rickety footbridge and back up the other side in order to get around the obstacle. We were back under way. At around lunch time Steve’s bike decided to stop due to an electrical problem. The fault was eventually diagnosed as a faulty ignition coil which meant our guide had to ride off to the local town and find one, which he did and eventually we were back under way, albeit running behind by now. Steve’s bike had rouble with the ignition along the way. Nothing that was not fixable out here. We had lunch at a small township Marpha before heading back towards the our stop for the night at a small hotel in a quaint valley. Steve dropped his bike a couple of times as the conditions were very difficult with deep mud and water crossing with large round rocks to ride accoss. Before the day’s end, Mahitah our guide found the rear brake lever that had broken off my bike which was quite amazing considering the deep mud. Steve and I at the start of the ride. 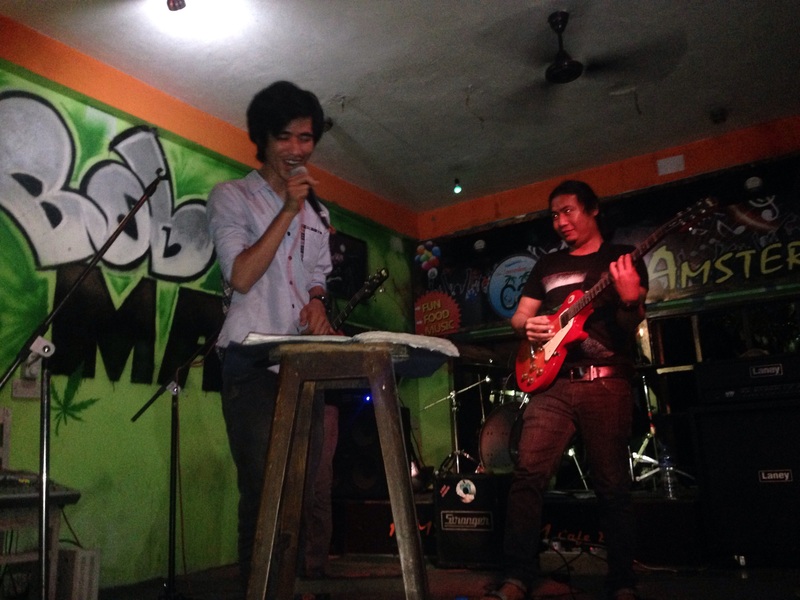 We certainly look fresher here. 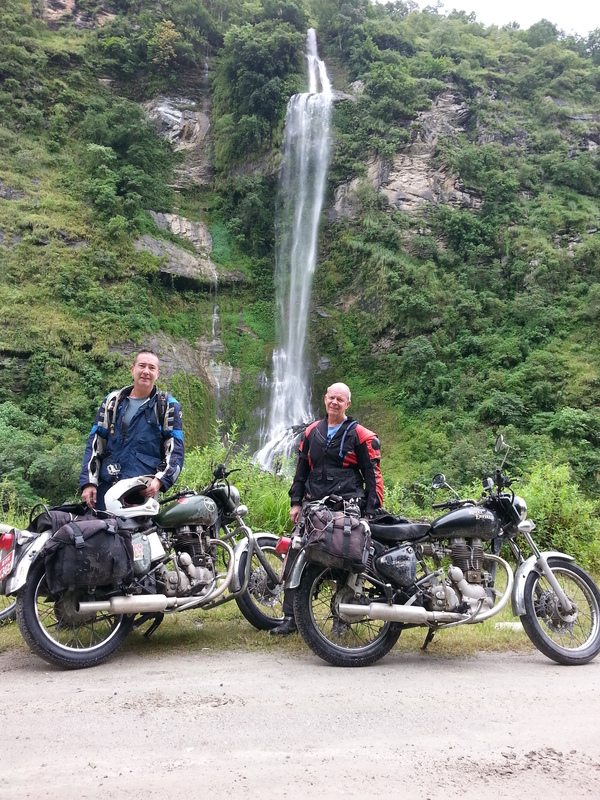 Today was the start of our Royal Enfield motorcycle tour taking us up into the Annapurna Ranges of Nepal. Steve and I were excited as the Royal Enfield has a great history as it was an old English brand that was taken over by the Indian’s back in 1957 and basically they have continued to build the bikes since with very minimal change. The bikes you see in these pic’s are 2009 models with some modern innovation such as a disc front brake and left foot gear change! The ride was to take us up into the ranges and soon became a lot tougher than either of us (and the guide) thought it would be. As it turned out there had been significant rain in the past week or so and the road had several rock falls along the way. My bike was the first to have an issue within the first hour as it started to missfire which necessitated a stop and change of spark plug. The problem re occurred another hour later which at the time was concerning however after a bit of fiddling the problem went away and did not re occur, thankfully. Mud soon became a major obstacle and would continue to be throughout the ride. Large rocks, significant water crossings and at one point we were forced to pay a load of local lads to carry our bikes down and up a hill due to a waterfall blocking our way. It was certainly turning out to be a great adventure. 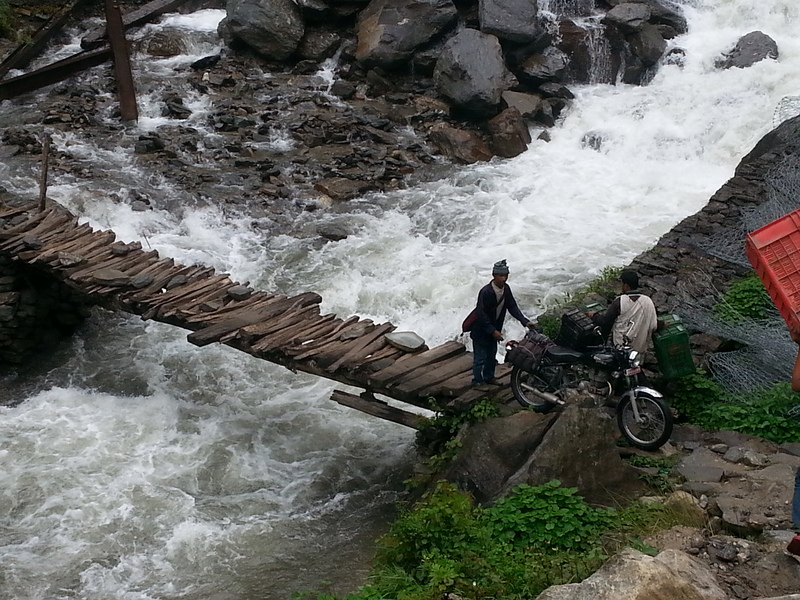 Crossing a foot bridge with the bikes. Fun! By the end of the first days ride, my bike had lost (yes, it fell off) the rear brake lever and the front brakes (that were iffy to start with) pretty much packed up in the end. Mahitah, our guide had arranged for his work mate to follow up behind and he arrived at around 8:00pm at our accomodation with a new rear brake lever. 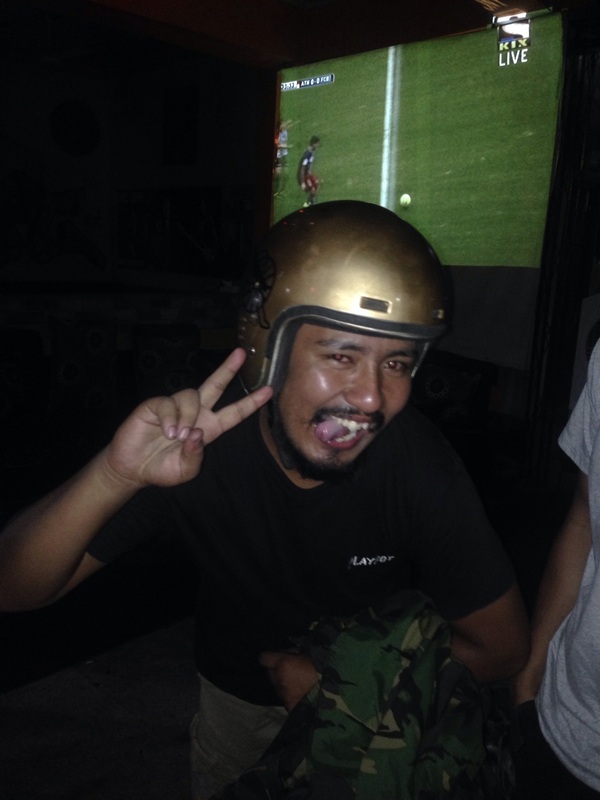 It took 5hrs riding for the mechanic to get the lever to us and he had to now stay the night. We were certainly having a laugh. 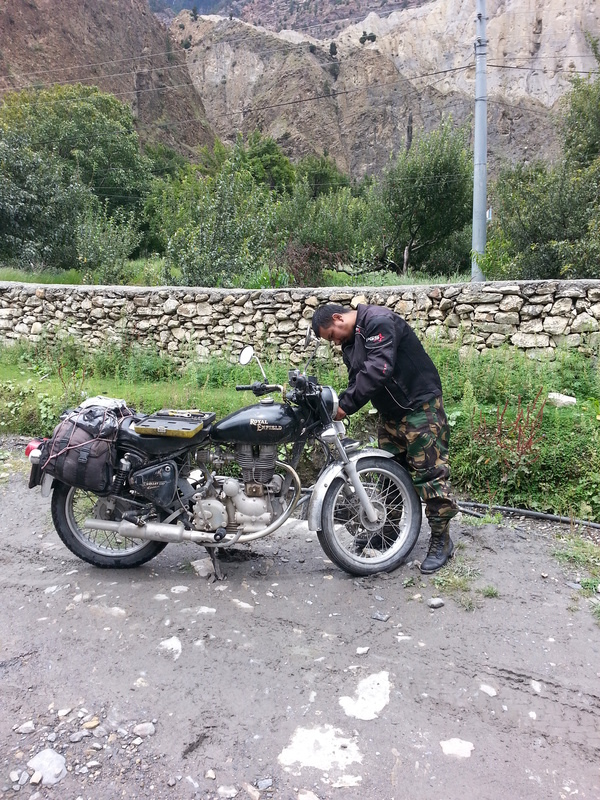 Riding these Enfield’s is not about the destination, but rather the journey and it was certainly an exciting journey. 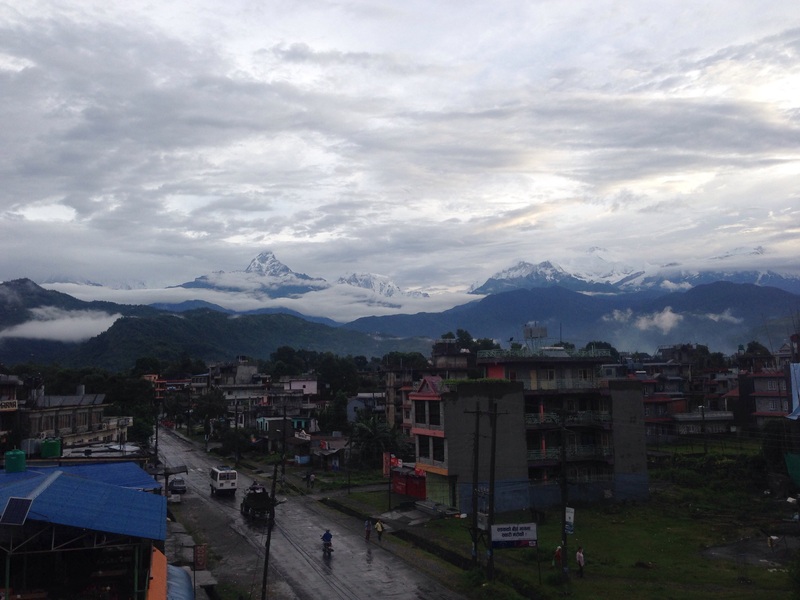 The Annapurna Ranges with peaks over 8,000m. Wow! We started the day with an amazing view of the mountains surrounding Pokhara as breakfast was served on the roof top restaurant which was simply amazing! 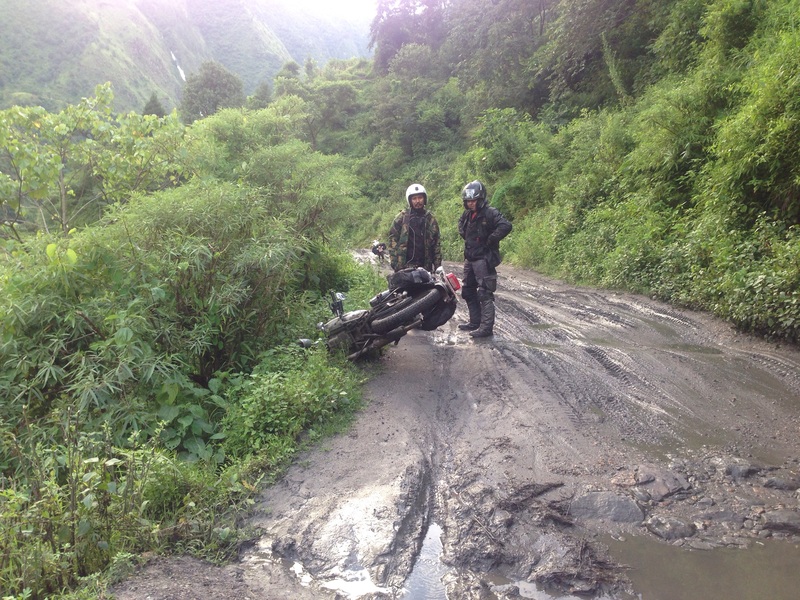 Our objective today was pretty straight forward as we needed to go to a company called Hearts & Tears Motorcycle Club which does adventure tours into the Annapurna Ranges which are basically part of the amazing Nepalese mountain ranges. 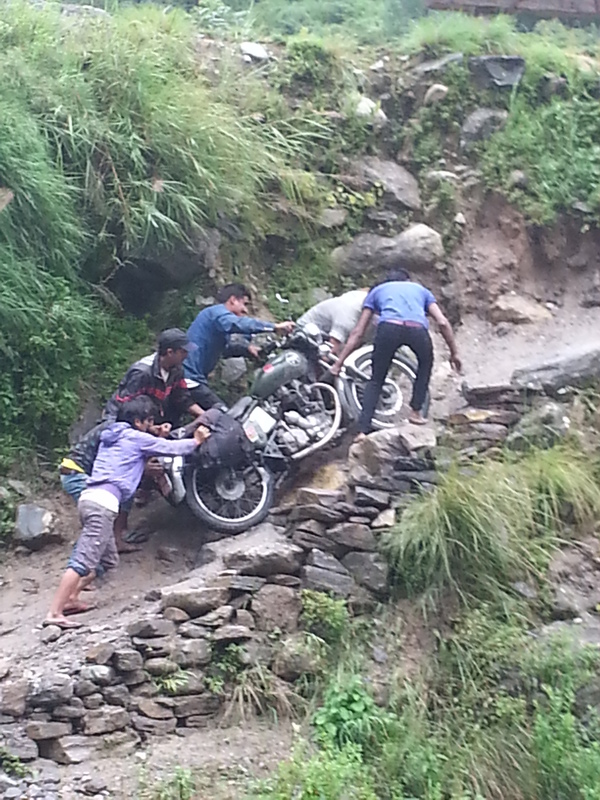 We had booked a 3 day bike ride up into the mountains riding Royal Enfield motorcycles. 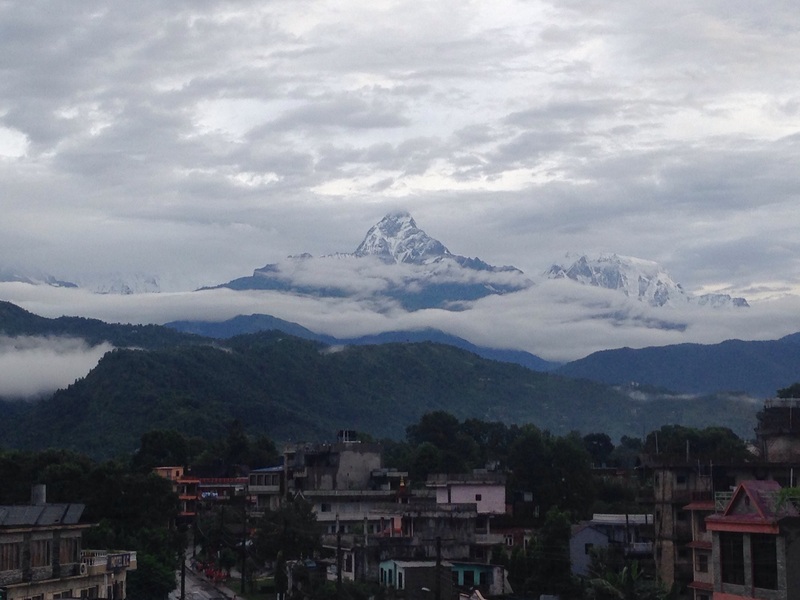 Pokhara is Nepal’s 2nd largest city, although still small it had a great feel to it with a lake running along one side and those amazing mountains in the background. We managed to find a good coffee shop while walking the town so we took the opportunity to relax and catch up on emails etc. we needed to be at the bike shop at 3:30pm as the owner, Matt was not in until then. 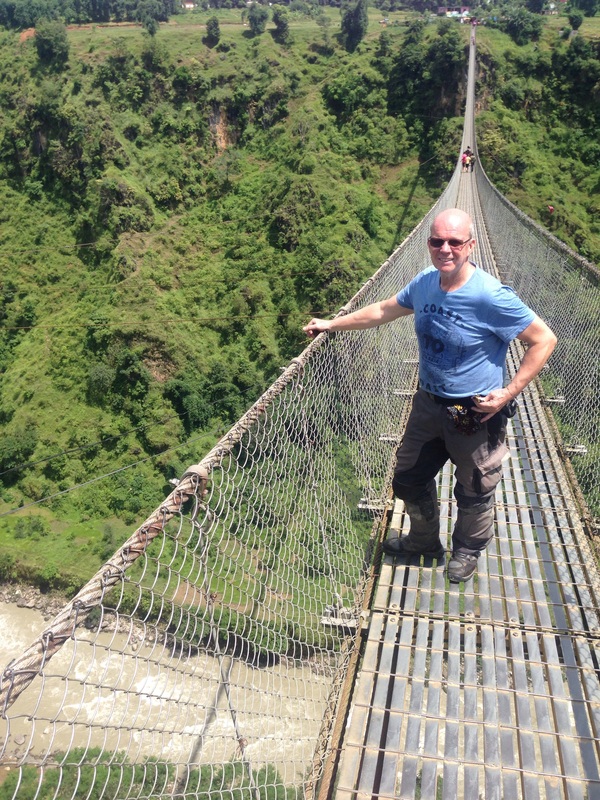 Turns out Matt, who is a great guy from Melbourne, was working for NGO’s in Nepal as a chemical engineer assisting with water quality and fell in love with Nepal and decided to set up his own business and stay. Tomorrow we start our Royal Enfield adventure! Our lovely host Promise from Hotel Garden. The ride to the boarder went smoothly and as with most boarder towns they tend to be decidedly yuk! This boarder was no exception with mud roads, trucks parked for approx 5km’s in the lead up to the crossing due to customs (must take a day or so to que for them). 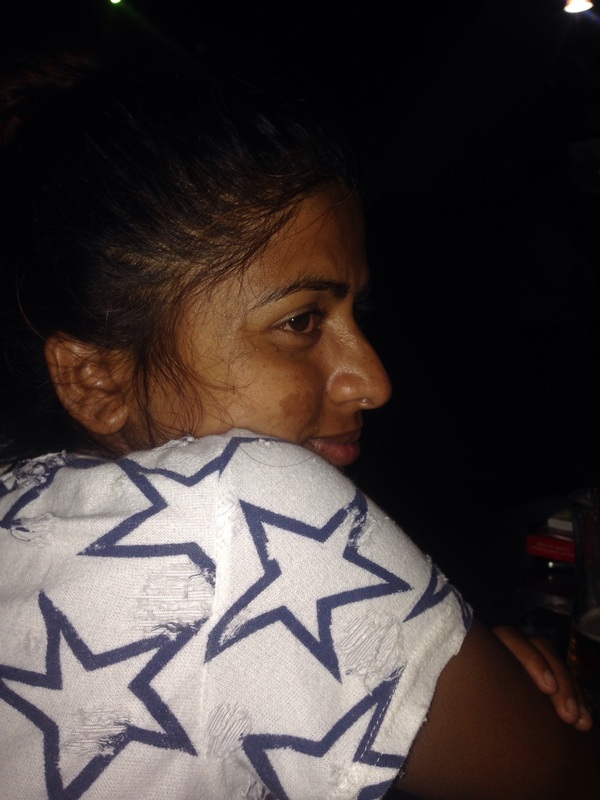 The place was so disorganised that we actually rode straight past the Indian boarder crossing and into Nepal, only stopping at the customs building before we realised what we had done! We back tracked back into India (a distance of approx 200m) and found a grubby office in amongst the shops that wa she customs office. 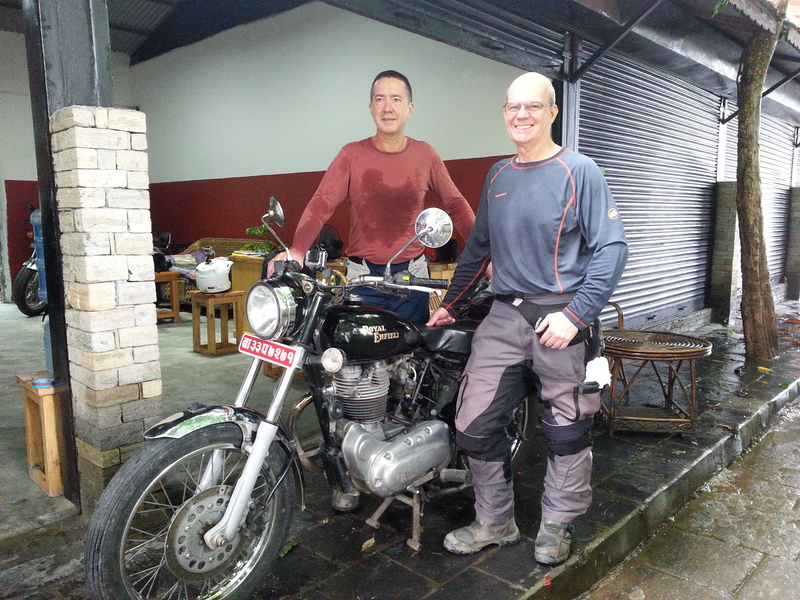 We cleared the bike Carne’s and moved onto the immigration before once again moving through to Nepal. The Nepalse customs and immigration buildings were only slightly better and just as beurocratic with us sodding around as the officers did not know what needed to be done to complete the Carne documents prior to allow us to move on. Finally we were into Nepal and on our way towards Pokhara which was a ride of approx 180km and the wether was closing in. We soon noticed the surroundings change shortly after we progressed as the towns had curbs and gutters, there was considerably less rubbish and our view of the world got a whole lot nicer! 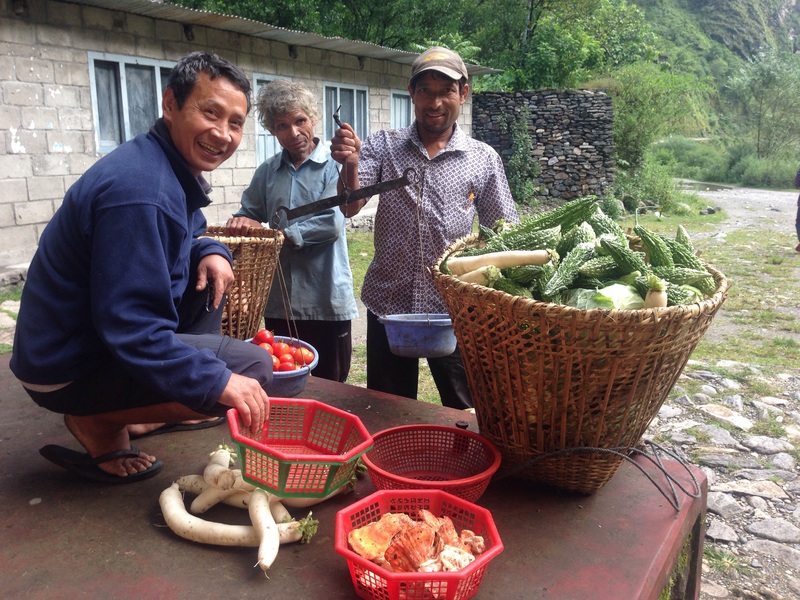 Nepalese people clearly were taking pride in their villages and it showed. The roads approaching Pokhara were very twisty and hilly, but made for a great ride, although it was quite wet by the time we made it to town and stopped at a fantastic little hotel (Hotel Garden) run by an extremely polite and friendly chap by the name of “Promise”. Nothing was too much trouble. 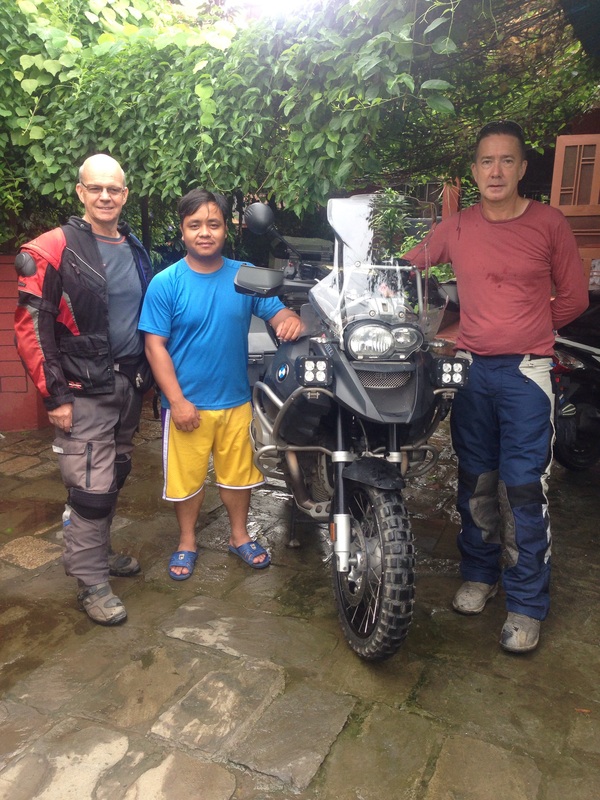 We had had had a great ride today and Nepal was shaping up to be a great leg of our Mad Ride. Today we road from Lucknow to Gorakhpur which is close to the Nepalese boarder. The day started with us making a navigation error which had us added another 15km’s to the days ride. We also had a few heavy showers again however temps dropped as low as 27deg which felt cold to us! As we approached Gorakhpur we took the ring road which then had us entering the area we needed via a really yucky village, with nothing but mud roads and huge pot holes. We are left wandering why the villages do not take some action collectively to improve their local communities. It was wet when we arrived at Gorakhpur and the town was pretty big but very grubby and clearly not used to westerners visiting. The language sounded different making it impossible for us to understand even the most basic of their language and very few locals were able to speak any English. After we arrived the rain stopped which allowed us to get out for a brief walk to get a bite to eat for dinner. 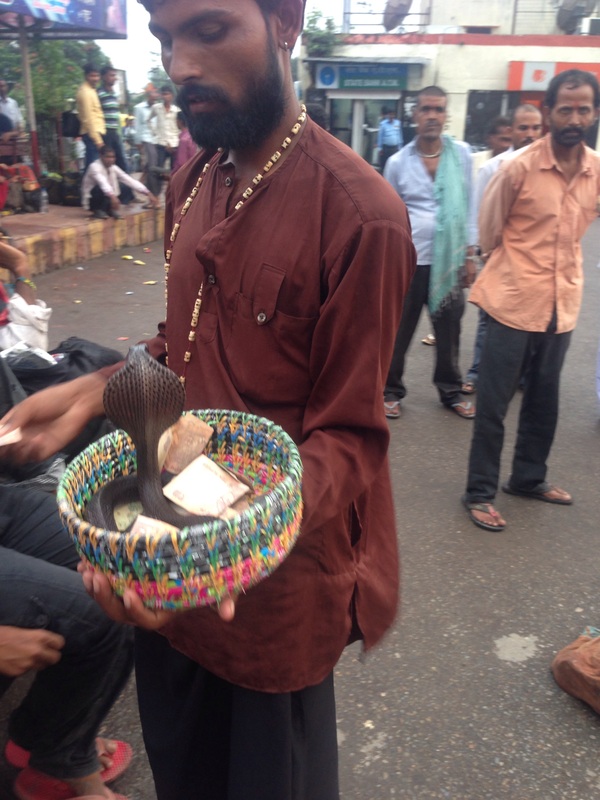 We grabbed a couple of samosa each and took a seat by the train station only to have a couple of men come up and set up busking by snake charming with Cobra’s and another rather deadly looking snake. 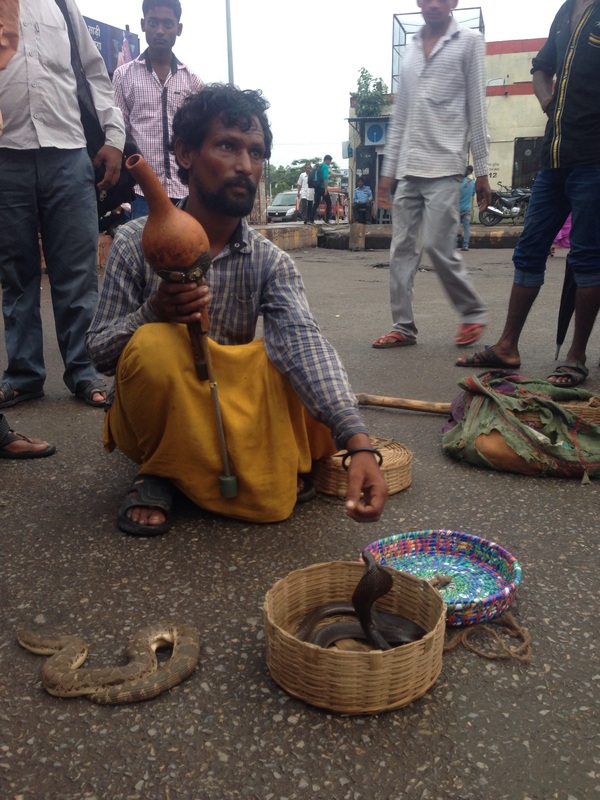 This was the first time we had seen this act in India which is famed for its snake Chalmers. Note, there is a trick to snake charming so if you are considering starting this as a career remember to remove the venom sacks (just behind the ear holes) and remove their fangs! All jokes aside, these poor animals are treated terribly!